What do you get when you mix a dedicated GPU, 50FPS Crysis gaming, A Core2Duo, an 11-inch screen, and a $800 price tag? An absurd(ly powerful) little laptop, which nobody—and apparently Alienware—is comfortable calling a netbook. 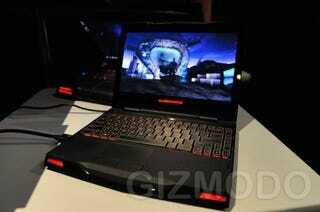 The Alienware M11x, with over 6.5 hours of battery life and weighing under 4.5 lbs. will start at an amazing $799! Leave it to the folks at Alienware to enable truly mobile performance gaming at an affordable price. Er, contest's still open, folks!